What you need to know is that, for my whole childhood, Vanessa was beautiful. Jess was bowlegged and scraggly with bad glasses and a boy haircut (love you, J! ), and I was knock-kneed with a perpetually scrunched face and a strong aversion to flattering clothing and hairbrushes — but Vanessa carried herself with an elegance that we just couldn’t match. In family pictures for much of my youth, Jessica and I practically scream WE ARE AWKWARD AND CONFUSED and Vanessa has a perfect little smile and the exact right outfit. She even made braces seem so cool that I was jealous I never needed them. 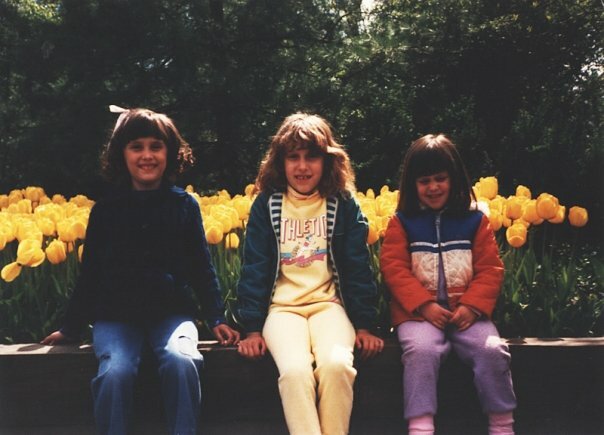 Jessica in the middle with gap teeth and a yellow sweatsuit! Christina on the right with an orange coat, purple sweat pants and a scrunched-up face! … And Vanessa on the left looking perfect, topped with a bow. And so of course, for her wedding — well, she found the perfect dress and had beautiful long hair and had everything just right. 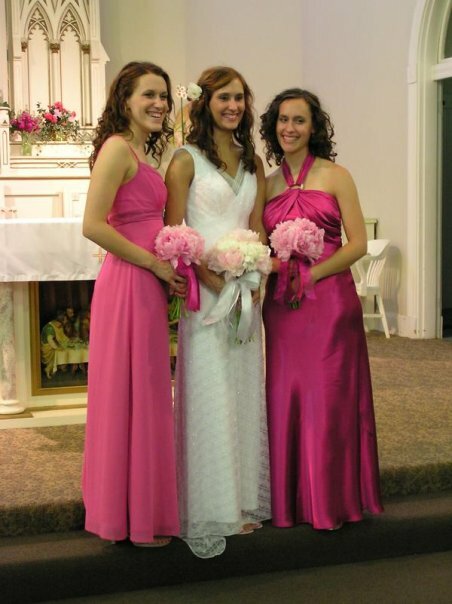 She made us all wear hot pink, and we did it, because we loved her EVEN THAT MUCH. But what I wanted to tell her in my little gift of a song was that love would win anyway. Love would win even if she didn’t have the perfect dress or beautiful long hair or everything just right. I don’t think you need any advice from me. Everything you need you’ve got already (right here). You don’t need a camera. There’s a better device inside you. The way the breeze feels on your skin, the way the sun comes up. And if your house burns down or floods to the ceiling, you’re okay. You still know what love looks like (right here). If your stomach growls a lot, if you lose your sense of hearing, you’re okay. You still know what love sounds like. You’ve still got pictures of love. The way a three-year-old laughs, the way a tree grows up. you’re okay. You’ve still got your pictures (right here). you’ve still got pictures that prove you’re part of something bigger. Pictures of love: the touch of a hand that feels like home and infinite stars above. I can’t help thinking of the people we all were back in June 2006, back before everything fell to pieces. I don’t really remember those people anymore. We were so young. We did not know the storms that were coming for us. But that version of me, that past-Christina, sent a little message years into the future to remind us that love still wins. Everything can fall to pieces and burn around us but I will never not love my sister and I will never not carry her love with me (right here). The cynical version of me (that present-Christina often becomes, now that we are not so wide-eyed) looks at my own lyrics and rolls my eyes a bit. “What more do you need?” Well, for starters, you need money. You need food on the table. You need warm clothes when it’s cold out or you will be crabby, and you need sunscreen in the summer or you’ll turn red and then your epidermis will fall off. Etc. You need more than love. But I don’t think past-Christina meant some floofy kind of “love” where you don’t have a care in the world except that you’re in love, or happy, or whatever. I don’t believe in that kind of love. It lies to you. No, this is brave love, strong love. It’s the kind of love that binds things, that holds us together when we’re crumbling and ties us to each other when that is the only way our spirits will survive. 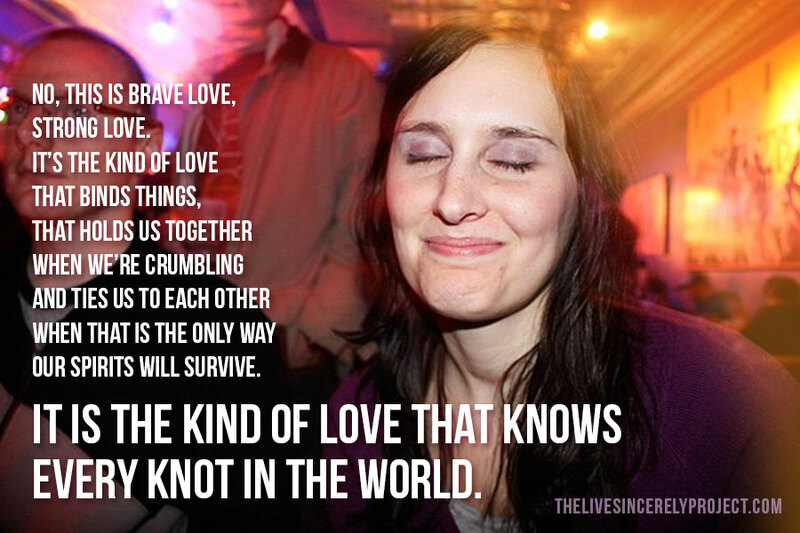 It is the kind of love that knows every knot in the world. Oh Christina, that song. I can’t get over the meaning it holds now, in the future. I’m so sad for most of the things that have happened to Vanessa in her life, but happy that she had your love (and Jess’s love, and your parents’, and Billy’s). I remember sitting behind Vanessa in a class in high school and thinking to myself she is built so great. I wish I had her long legs and her long hair; she’s so pretty and smart. And graceful, very much a lady. Then I’d talk to her and think how nice she was; beautiful on the inside as well. That’s how I have and always will picture Vanessa. As that girl in that class. I remember Vanessa as the one that would cling to your mom when you guys would come out to our house. I was told that it would take her a while to warm up. Then before you knew it, she was up and out playing with the other kids. She never got dirty though. It truly is a shame that all this has happened to her. But beauty is only skin deep. She, on a good day, she is probably still the sweet and concerned about other people as she has always been. What a beautiful message. The beauty and inspiration that you have ALL taught us cannot be replaced or remade. It will be with each of us forever, etched in our hearts. 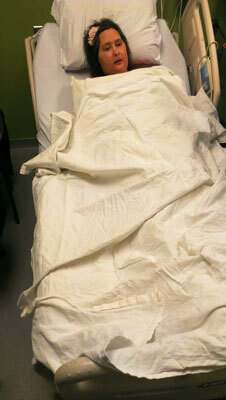 It takes bravery, courage, love, and sincere compassion to continue sharing your stories, and Vanessa’s. Thank you. You have all my best thoughts, all my love, all of the everything I can give. This is beautiful. I have no words. “you do not have a soul. everything you need…Love that never dies. No words for today. Only love. Only love. Such a blessing to have met V if only for a few times. Love and prayers for peace to Billy and your entire family. I am new to your site and don’t know any of you, but having had a ton of losses myself, I have been reading your posts. They are so touching and real. Your song is beautiful and so is your voice. What a great gift that was and I can also relate to how you must reflect on it now.